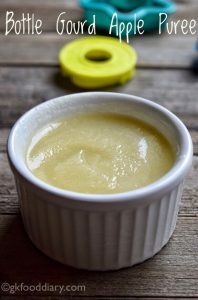 Homemade, quick, healthy and wholesome 12 vegetable purees for babies with a step by step guide. Introducing vegetables to your baby in an early stage helps to encourage healthy eating habits and make them less fussy about vegetables in the future. Vegetable purees are a great way to introduce vegetables in baby’s diet. Also its very easy to make at home rather than buying expensive store-bought vegetable purees. 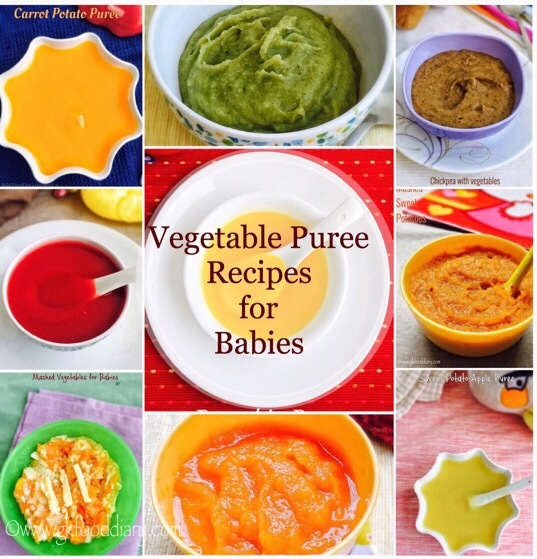 Here are some easy and vegetable purees recipes for babies. Check out our collection of homemade baby food recipes for 6-12 months here. Bookmark this page for future reference as I will be updating this post on a regular basis. 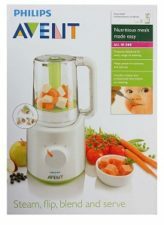 Click on each thumbnail image given under each vegetable puree heading for the detailed recipe Choose recipes according to your baby’s age which is mentioned in the brackets along with recipe heading. Steaming vegetables are the best-recommended cooking method to retain most of the nutrients rather than boiling the vegetables. Always serve the vegetable purees fresh and warm, though some purees can be frozen. Better to consume the purees within 2 hours from the preparation. Make sure to introduce each vegetable separately before you try combination vegetable purees to your baby. You can mash the vegetables after cooking with a fork or masher instead of using a blender/mixer. If the puree is too thick after cooling down, you can adjust the consistency by adding breast milk/formula milk/ cow’s milk or warm water. Make sure to not to boil/cook the formula milk if a recipe calls for formula milk. Prepare the puree with water and once the puree is warm, add prepared formula milk. If your baby is allergic to any ingredient used in the vegetable purees, please remove it while preparing. Carrot is an ideal first food for babies as they are easy to digest and less allergenic. It is the best source of Vitamin A as carrots are rich in Beta-carotene. Also, the antioxidants in carrots are good for baby’s eyesight. Sweet potatoes are one of the favorite first food for babies as they are less allergenic and soft. It is naturally sweet and packed with Vitamin A & C. Sweet potato puree is rich in fiber which helps to cure constipation in babies. Pumpkins are great first food for babies and loaded with Vitamin C and beta-carotene, also a good source of protein and iron. 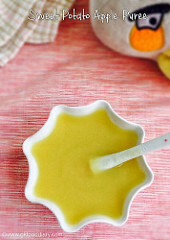 Babies will love this pumpkin puree recipe for its sweet taste. White potatoes are loaded with carbohydrates and have some reasonable amount of Vitamin A & C. Potatoes may cause gas in some babies and hence its ideal to wait until the baby is eight months old to introduce potatoes. 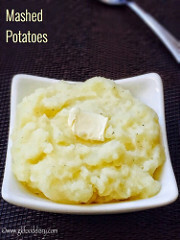 This delicious mashed potato is the right choice when you start potatoes for your baby. Beetroots are rich in iron and Vitamin A. 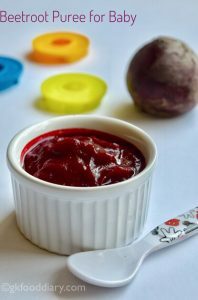 But some babies do not prefer plain beetroot puree, this creamy wholesome combination of beetroot carrot and potato puree is the best way to include beetroot in baby’s diet. 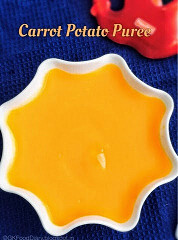 Carrot potato puree is a sweet and creamy puree with a healthy combination of carrot and potato. This puree tastes so delicious that even fussy babies can’t say a no to this puree. Make sure to introduce carrot and potato separate to your baby before you try this puree. 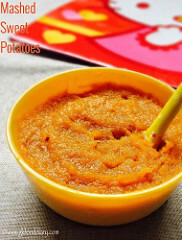 This soft apple sweet potato puree is a favorite puree for most of the babies. Apple and sweet potato make a great combination, and the flavor is so good when they both are combined. Apples can be replaced with pear for a different taste. 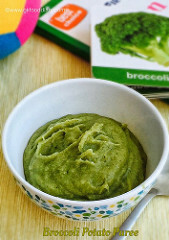 Broccoli potato puree is a healthy and filling puree for babies. Its also tasty, creamy and has a smooth texture which makes it perfect for babies. 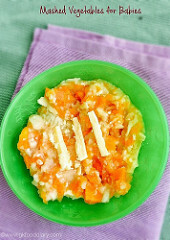 This mashed vegetable recipe is a perfect way to introduce a new texture to your baby. This mashed vegetable recipe is ideal for babies from 7 months when you shift from purees to mashed food. Make sure to introduce each vegetable separately before you try a combination of vegetables. Chickpeas are healthy legumes which are rich in protein, iron, and fiber. This mashed chickpeas with vegetables are a great way to include chickpeas in babies diet. It has a mild taste and suits the little ones taste buds. Beetroot is packed with vitamins, iron, and minerals. 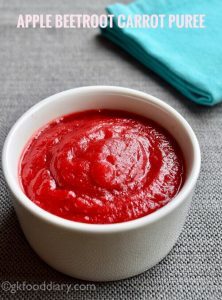 This beetroot puree is the best way to introduce beetroot to babies. 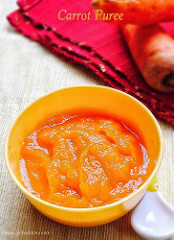 Babies may prefer this puree for the lovely red color and naturally sweet taste. 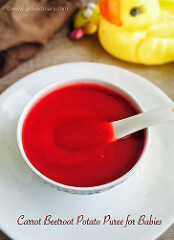 Beetroot Puree can also be added to baby porridges as a sweetener. The combination of apple, beets, and carrots is packed with all essential nutrients, minerals, and vitamins. Also, it makes an excellent refreshing puree for babies. This apple beetroot carrot puree is naturally sweet, and babies will love it for sure. 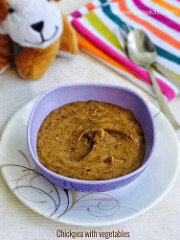 Nutritious puree recipe for babies with Bottle gourd and Apple. Bottle gourd/lauki/Surakkai is a nutritious vegetable with many health benefits. Some babies don’t prefer the plain taste of bottle gourd, so the mix of this bottle gourd & apple makes for a tasty sweet puree with added health benefits from apple. Make sure you have introduced each vegetable separately and checked for allergies before trying any combination vegetable purees. Avoid salt and any sugar at least until one year. Thanks. Glad you found this helpful. As of now, we have only this website and youtube channel for baby food. I shall try to publish some book in the future. Can we store these purees? If yes, how and for how many days.